Similar to the other chair rails at Montpelier, the chair rail in the Drawing Room was removed in ca. 1848 during a major renovation of the Mansion’s interior. Except for one noticable difference the process of recapturing and redesigning the Drawing Room's chair rail was identical to other rooms in the house. While reviewing the letters sent by, and to, Madison, architectural historian Mark Wenger came across an 1809 letter from President Madison’s carpenter, James Dinsmore, asking Madison to send him “150 Small patrins for the Surbase of the Drawing room” from Washington, DC. Because the Restoration Team knew that “surbase” was another word for chair rail, it was quickly assumed that Dinsmore was referring to the chair rail in the Drawing Room. However, what Dinsmore meant by the word “patrin” was a more difficult mystery to solve. 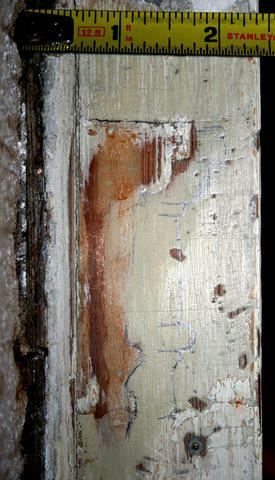 The chair rail profile found on the side of a window in the Drawing Room.